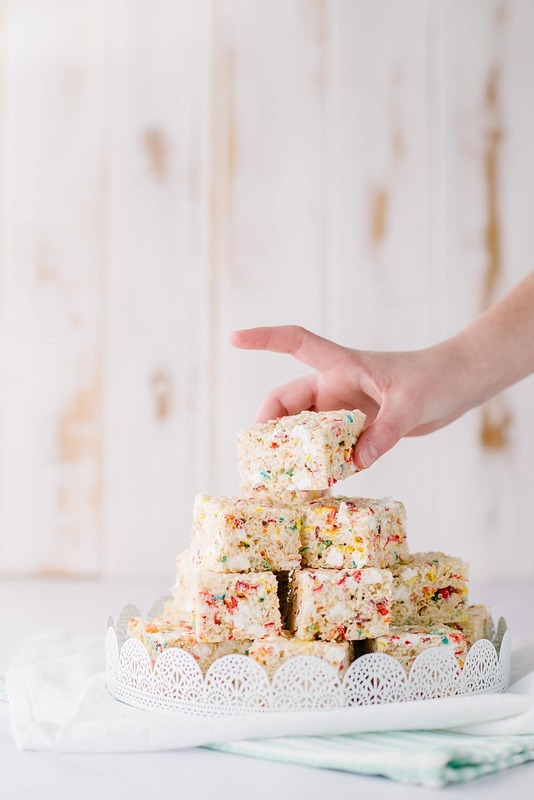 Rainbow Rice Krispie Treats for a good cause // The perfect combination of Rice Krispies, Fruity Pebbles, and marshmallow. Everyone is powerless over these. 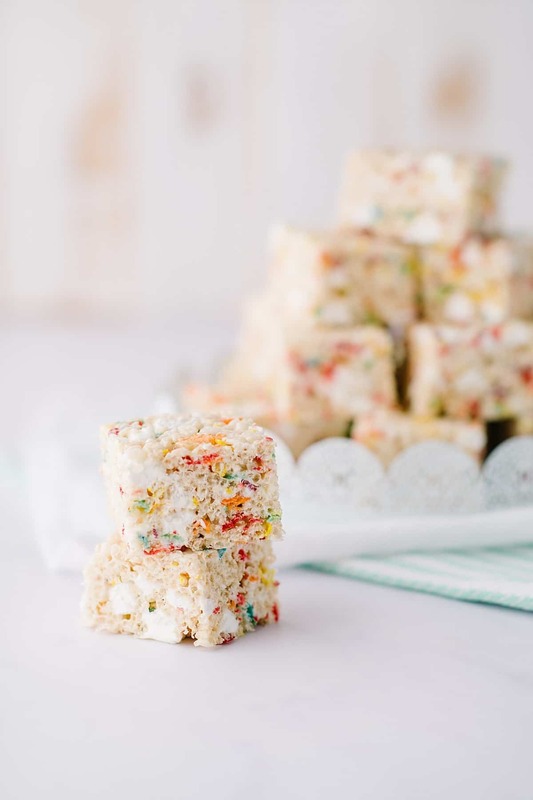 Ava dubbed these Rainbow Rice Krispie Treats as “rainbows in a dark place”. 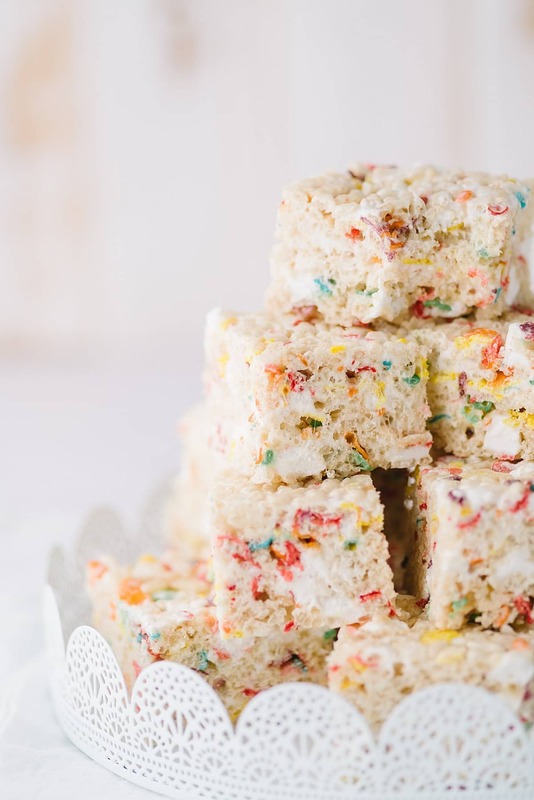 During a challenging January, we made these at least five times and played with the ratios until we ended up with the perfect combination of Rice Krispies, Fruity Pebbles, and marshmallow. 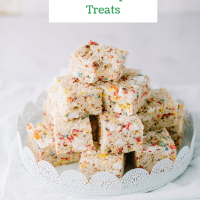 These are so delicious and no one can resist them. 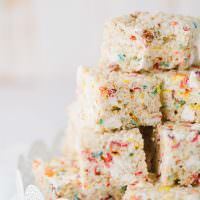 Make a pan and they will be gone in minutes. 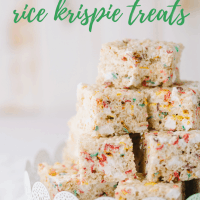 I’ve witnessed this, people are powerless over a good Rice Krispie treat. Ava’s title is particularly poignant today because these bars are to raise awareness and money for the fight against pediatric cancer. Even when faced with the unthinkable, children have so much hope and positivity. I don’t know anyone whose life has not been touched by childhood cancer. I can’t think of anything more unfair or unjust than having sweet babies and children go through something like that. I was at dinner the other night and sitting across the table from me was a little girl, she’s 3, that is a cancer survivor. The experience that her parents went through, the strength and bravery she had at the age when her biggest challenge should be learning to write her name and riding a bike with training wheels. I can’t help but be in awe of that. She is now cancer-free. That wouldn’t be possible without incredibly smart people that gave her the best care possible. Not just the doctors and nurses that took care of her, but the people that created the treatments that would keep her alive and thriving today. Doctors and researchers are making progress, but they need more money dedicated to pediatric cancer. Less than 4% of the money raised for cancer research goes to pediatrics. 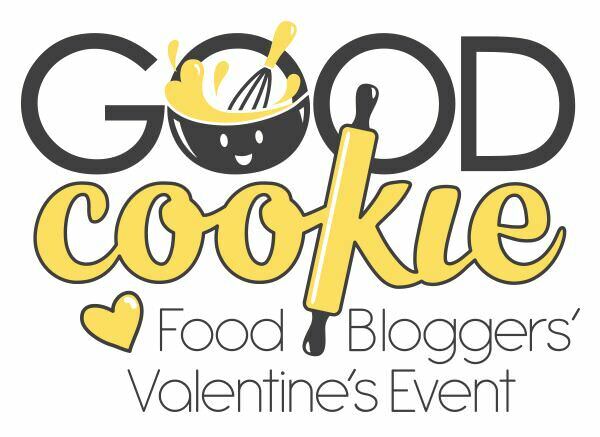 Today, my food blogger friends and I are trying to spread the word about this issue with some delicious Valentine’s inspired cookie recipes. We raise thousands each year and some amazing and generous brands have partnered with us to match our donations. I’ve played with the ratios of cereal to marshmallows many times and I have found this combination to be the perfect one. I like them thick and very marshmallowy. I like adding another bag of marshmallows in with the cereal. They melt a little but still hold some shape. The addition of Fruity Pebbles was inspired by Anna is the Worst. The Fruity Pebbles not only add color, but also some citrus-y vibes that I am into. I’m going to give these a try with cornflakes. What other cereals can we try in here? Don’t skip the salt. I know it seems counterintuitive to add salt to sweet, but it enhances the flavor and keeps it from being too sweet. 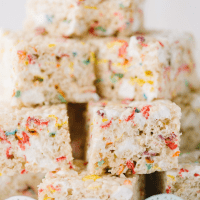 Rainbow Rice Krispie Treats // The perfect combination of Rice Krispies, Fruity Pebbles, and marshmallow. Everyone is powerless over these. Line a 9×13 pan with parchment paper and spray with cooking spray. Set aside. Melt butter in a large Dutch oven or pot. Add two bags of marshmallows and stir until completely melted. Remove from heat and add salt and vanilla. 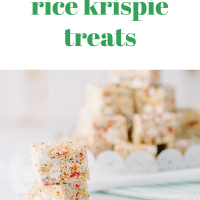 Add Rice Krispies, Fruity Pebbles, and the additional bag of marshmallows to melted marshmallow. Stir to coat completely. Turn out into prepared pan. Spray an offset spatula with cooking spray and press into pan. Let set in pan for one hour before cutting into bars. Thank you to Dixie Crystals, Mediavine, and OXO for their generous donations and for partnering with us for this cause. 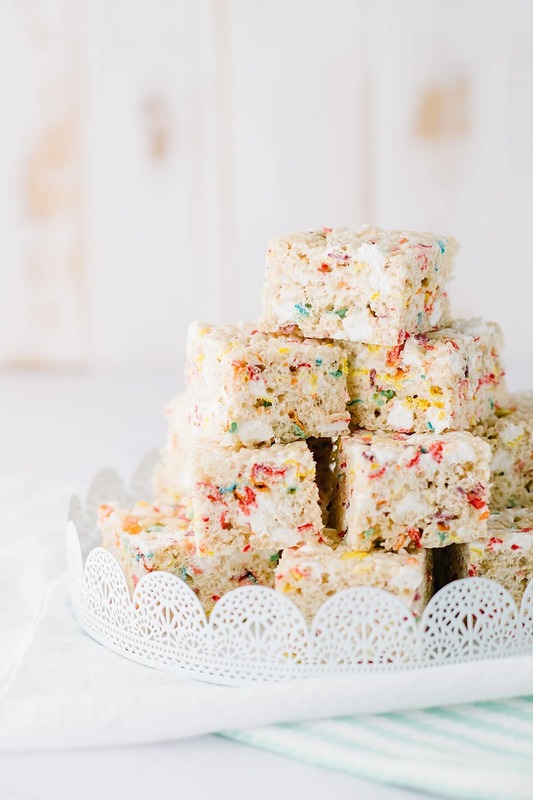 Bree, Thank you for a beautiful recipe for such a worthy cause! Thank you for generously matching our donations, we appreciate it so much!